Flowering Cuphea llavea in a container. Cuphea llavea is one of about 260 species of Cupheas in the loosestrife family (Lythraceae). This fast growing tender broadleaf evergreen sub-shrub native to Mexico is sold as an annual or houseplant in cooler climates, sometimes under the synonym C. blepharophylla. It is often a conversation plant due to its unique flower shape. The flowers of Cuphea llavea resemble a purple bat “face” with red petal “ears”. 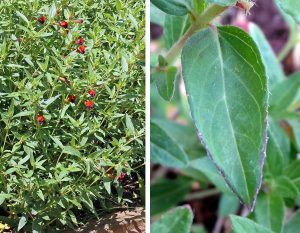 Bat-faced cuphea produces many stems (L) with pointed, hairy ovate leaves (R). Plants can grow up to 2½ feet tall, but when grown as seasonal annuals generally only become 12-18 inches tall with an equal spread. They have a rounded, bushy habit and the foliage remains fresh all season if watered sufficiently. The stems are crowded with alternate dark green, thick, sandpapery leaves up to 3” long. Each ovate leaf is pointed and hairy. The foliage can tolerate light frost but not a hard freeze. 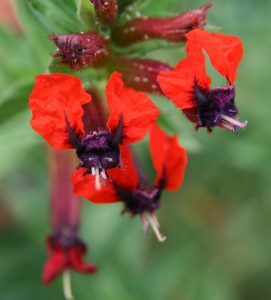 Bat-faced cuphea flowers are visited by hummingbirds and other pollinators. Bat-faced cuphea begins blooming in late spring and continues until frost, producing clusters of numerous flowers in the leaf axils. Each flower has a one inch long, hairy purple calyx with two upward facing red petals at the end, forming the “ears” to go with the “bat face”. The remaining four petals are just little spiny remnants in the species, but in some cultivars these are fully developed. 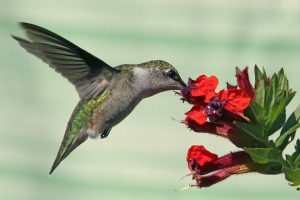 Flowers are attractive to hummingbirds, bees and butterflies. The small, brown lentil-shaped seeds are found at the base of spent flowers that remain on the plant. Bat-faced cuphea blooms in clusters in the leaf axils (L), with hairy buds (LC) opening to tubular flowers (C) with two upward facing red petals (RC), a hairy purple “face” and four vestigial lower petals (R). ‘Diablo’ – has hot red flowers on tall, graceful plants. Flamenco Samba™ (PP17823) – this hybrid of C. llavea and the annual C. procumbens has six slightly ruffled, well developed dark red petals with a bluish cast on a 10 inch high sprawling plant. Other colors in the Flamenco series include Cha Cha, Rumba and Tango with bright fuchsia-purple, light red, and hot pink flowers, respectively. The Sriracha™ series – has large petals with a papery consistency in separate rose, violet and pink varieties. Plants are well-branched and compact. Tiny Mice® – has two small red-orange petals on a small plant that gets about a foot high and wide. Torpedo’ – is a larger flowering form with flowers about 1½ inches long. Totally Tempted® – is a hybrid with larger, showier flowers with and well-developed bright red petals on a compact plant. The Vienco® series – are a hybrids with more open, showier flowers with ruffled petals in six colors, including bicolors and white. 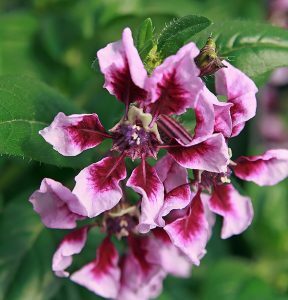 Combine bat-faced cuphea with red or purple flowers or foliage to complement the flowers. 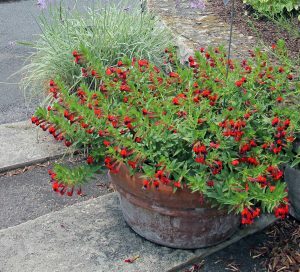 Plant bat-faced cuphea in annual beds, along the edges of borders or paths, or in containers – including hanging baskets – where its unique flowers can be appreciated up close. 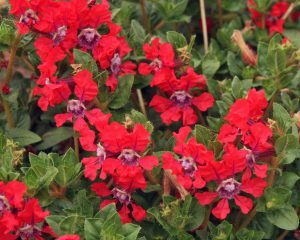 Combine bat-faced cuphea with plants with purple foliage or bright purple flowers to complement the dark “faces” of the flowers or red flowers, such as bright red impatiens, to coordinate with the “ears”. Use it alone or mixed with other plants such as coleus and ‘Blackie’ sweet potato vine in containers. Container-grown plants can be moved indoors to overwinter in a bright, sunny location with at least four hours of direct sun. Reduce watering and keep relatively cool (60sF). 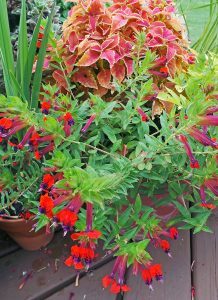 Grow bat-faced cuphea in full sun. 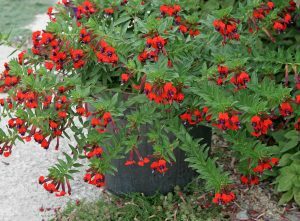 Grow bat-faced cuphea in full sun in the ground or in containers. Provide regular moisture, although plants will tolerate dry conditions occasionally. 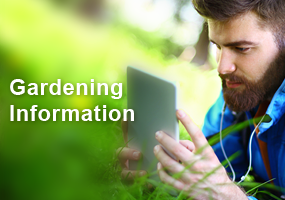 Fertilize plants in containers several times during the summer months. Pinch back or shear if plants become too leggy later in the growing season. This low maintenance plant has few insect or disease problems, but may be infested with whiteflies, mealybugs or aphids. C. llavea is propagated from seed, short softwood cuttings taken in late spring, or large plants can be divided. 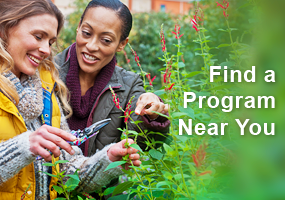 Start seeds indoors 10-12 weeks before the average last date of frost. The seeds need light to germinate so just press into the soil surface or barely cover. 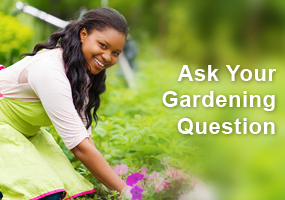 Seeds should germinate in 8-10 days if maintained at 70°. What a cool flower, I didn’t know about it until your article. Thank you! Happy the birds and bees like them, I don’t usually buy a lot of annuals but I might have to get this one. This is one of my favorite annuals. The name is perfect and it is super-cute. The different names are hilarious…maybe combine the Flamencos into one or two pots for some Latin flair? I put up baskets on our fence this year for herbs but I think next year I’m going to grab some cuphea to mix in. Ole! I have been looking for a red purple combination and something unique that kids would find wonder in. This is it! I had not seen this plant before but now that I know about it and how well it does in an annual container, I will look to purchase it next Spring. Quite unique and wish I could have this plant year round. I buy this plant every year. Hummingbirds love it and it has become a tradition for us. This flower is really cool looking. I have never heard or saw of the bat-faced cuphea. I might have to try the Totally Tempted one for my hummingbirds. Thanks for the article. Beautiful. I wish I had room in my living room for it during the winter.